Tucked away off the Jurassic park-esque coast south of Cairns is the unpretentious but special Fitzroy Island. Both the island and its surrounding waters are part of the Great Barrier Reef World Heritage Area. The island is predominately National Park with rainforest all the way down to the white coral beach. The fringing coral reef means so you can step into the water and snorkel straight off the coral beach. Fitzroy Island Resort is the only accommodation on the Island and offer a range of options from bungalows to beach view suites. They also manage the small campground on behalf of the council which is a budget way to experience and island holiday. A four star resort, not an uber luxury retreat, Fitzroy Island Resorts is an affordable island alternative for people who love the outdoors. The ferry to Fitzroy Island is $78 return or you can also book transfers through Raging Thunder or Sunlover Reef Cruises. 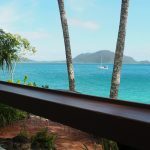 If you are staying at the resort Sunlover is a good option for a combined transfer and reef trip the day of arrival or departure for your stay (as they go via Fitzroy Island from Cairns in each direction). Then just book a direct one way transfer with the resort for your other trip. Thinking about making a last minute booking? Check the Fitzroy Island website as they often have cheap last minute standby rates that include the ferry transfers for free! 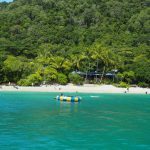 [td_block_text_with_title custom_title=”Things to do on Fitzroy Island” separator=”” tdc_css=””] Fitzroy Island is the perfect day trip for outdoor enthusiasts, with more than enough to fill in days at a time. Check out the blog post 8 hours on Fitzroy Island to help you plan your day trip to the Island or see the quick list of the Top 5 things to do on Fitzroy Island. Welcome Bay on Fitzroy Island is home to a fringing reef which means you can snorkel straight off the beach. You can hire snorkel gear from the CDC Dive store in the resort or the Raging Thunder Beach shack. Both shops also hire out kayacks and stand up paddle to use in the bay. If you would like to visit little Fitzroy Island you will need to join a kayak safari with raging thunder. Pre-book this activity as it often books out. There are several bushwalks available on Fitzroy Island ranging from the moderately graded Nudey Beach & Secret Gardens track to the difficult climb up the Fitzroy Island Summit. For beautiful views and a challenge the summit walk is your best choice, a 3.6km circuit that takes you through rain forest before you emerge on top of the world. The popular Nudey Beach walk takes you to a little coral beach with views out of the Qld Coastline. On a calm day it is a tranquil little beach with picture perfect aqua water. It’s just 1.2km return with lots of small hills to get there. The quieter 1.2km secret garden track meanders through the rainforest past huge vines and trees. Don’t forget to look up as you pass through the forest. The walk ends at a platform to sit and enjoy the rainforest before you return back to the resort. 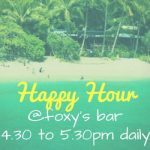 Foxy's Bar on Fitzroy Island may just have Australia's best bar view!